Challenge yourself with the ultimate practice drill! It�s the most wonderful time of the year: Christmas, winter and the Mosconi Cup! This time of year gets me excited, so I figured I would give you a special holiday gift: the ultimate drill! �The Monster� is the ultimate test of feel and patience and skill. It is the craziest drill I�ve ever done and one of the most satisfying drills I�ve ever completed. It took me more the four hours to complete this drill, and I was so excited when I finally did, that I pinned the video to the top of my Facebook page (Darren Dynamite Appleton). The video has well over 1 million views! I realize most of you will be thinking this is way too hard. Well, that may be true, but that�s part of the fun. You don�t need to complete it. It is the equivalent of running a 147 in snooker or a nine-pack in 9-ball. My highest run in snooker is 145. I keep pushing to get to that 147. This drill is the same thing. You constantly push yourself to a better result. You always have a number to try to beat. And with that extra effort comes improvement in your game, and that�s the ultimate goal, isn�t it? This is an easy drill to set up. As you can see in Diagram One, you shoot the 1 through 15 in rotation. The cue ball is not allowed to contact another ball. All 15 balls must be shot into one pocket! The diagram shows the positions for the perfect run out. Just getting to the 9 ball is a real test. Again, keep pushing yourself to be one ball better on every attempt. It will really force you to focus. It will also force you to learn to stay on the right side of the object ball, so this is great for pattern play in rotation and most other games. The further you advance, the more feel and trust become factors because the nerves and excitement increase as you progress. The pressure of completing the drill or setting a new standard becomes really noticeable and you have to teach yourself to battle through those nerves. If this seems a little too daunting, you can always start by allowing yourself to pocket the balls in rotation but in any pocket. Diagram Two illustrates how I completed this drill using all of the pockets on the one side of the table. This drill is very makeable for all players. Every shot requires your full attention. As you can see, I played the 1-6 into pocket E, as shown in Diagram One. 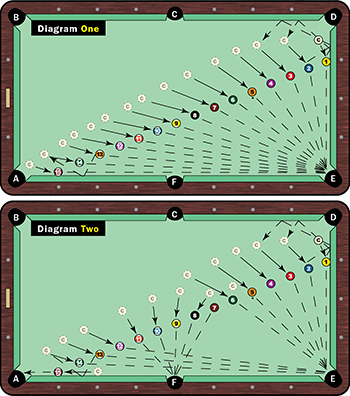 I opted to shoot the 7-11 into the side pocket (F), always leaving a slight angle on each ball. The real test starts with the 12-14. These are the key balls. This part might send you mad, but it is a lot of fun when you know you can complete it. I played the 12 into pocket E and drew straight back to leave a little angle on the 13. This is the hardest shot in both drills because the window for position is so narrow. Position must be perfect. If you can get proper position for the 14, simply follow the shot a bit to finish the 15 in pocket A. This drill is a true test of patience and focus and will have a big impact on improvement with the cue ball. This drill offers a great challenge, but anything is possible if you put in the work. If you reach the 11 in Diagram One you are doing very well. If you get to the 12-13, you are really good. And if you complete this drill, you are ready for any challenge I give you in the future.